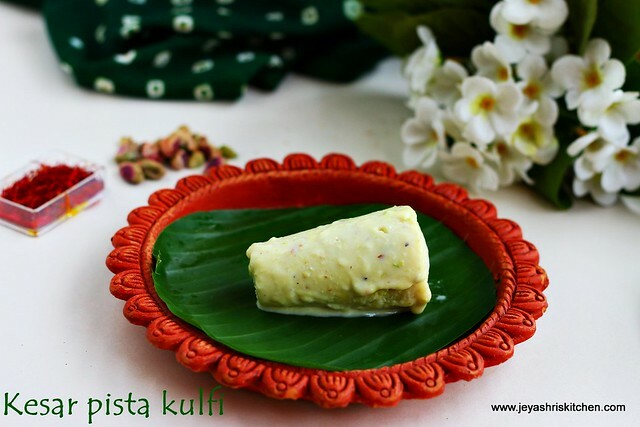 Kesar pista kulfi recipe is a popular traditional Indian ice cream. I have already posted the kulfi recipe, this kesar pista kulfi i have given for Kungumam thozi magazine. This recipe got published last week. From my childhood i love to eat kulfis. We get from a local guy who used to bring this at night during sumer season. They serve the kulfi in banana leaf. Many times the guy who sells kulfi take banana leaf from our home as we have lot of banana tree at home. My grandmother used to scold him for taking it at night time as generally they won't give anything in night. 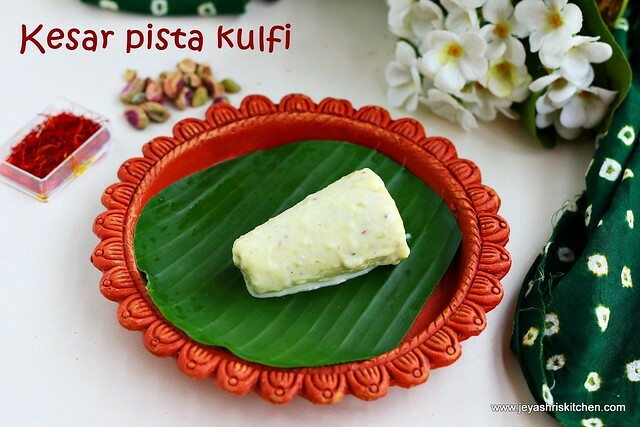 Make this kesar pista kulfi for kids and let them enjoy their summer with this traditional Indian ice cream. Check out my mango kulfi recipe too. In a heavy bottomed pan add the milk and cook for 10 minutes, keep stirring in between. Soak the saffron in 1 tblsp of warm milk and keep it aside. Pulse the sugar, pistachio and cardamom into a coarse mixture, in a mixie. Dissolve the corn flour in 2 tblsp of water without any lumps. Add the saffron milk and corn flour mixture to the boiling milk. Please be careful, once the corn flour is added the milk starts thickening. So stir it continuously. Also keep the flame very low. Add the coarsely ground pista sugar mixture too. Pour it into kulfi moulds. If you do not have moulds, simply pour it in small stainless steel tumblers and cover it with foil and insert a ice cream stick in the center. Cover it and freeze for 6 to 7 hours or overnight. Run the moulds over water and carefully take it out using a sharp knife. Kesar pista kulfi is ready to serve. Instead of corn flour you can add 1/4 cup of milkmaid too. After adding corn flour keep the flame low and stir continuously, else it will stick to the bottom and get burnt. Instead of pista you can add badam too. Hi jeyashri, looks yummy! Can I use the popsicle mould to make this? Would it come out the same way? HI jeyashri, at what consistency should we switch off and pour into moulds ? Thanks a ton for tis recipe Jayashri. Last month, weh v went to Chennai, tasted d kulfi from Aavin parlour regularly, weh v returned to SG,me n my hubby were carving for it. Finally i made it today...taste was just out of d world. I used badam n added a spoon of MRT badam power n some crushed cashews...yummy. Wonderful, happy to know that. Nice variations too.